A fine example of a bay fronted period style mid terrace family home offering 3 reception rooms and 3 double bedrooms. 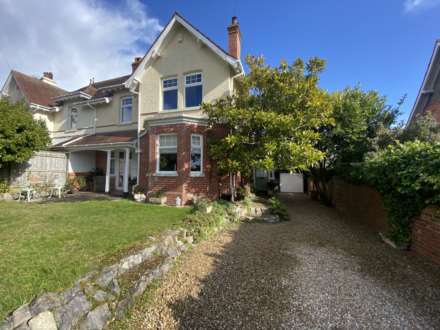 The property is situated within walking distance of Exmouth Town Centre, local primary and secondary schools. Two central heating radiators. Understairs storage cupboard. Further storage cupboard with shelving. Cloaks hanging rack. Fitted shelving. Double glazed door to side giving access to the garden. Doors to Principal rooms. Stairs rising to half landing. Double glazed bay window to front aspect. Period style features which include: tiled fireplace and surround, high skirting boards, picture rail and cornice to ceiling. Central heating radiator. Television aerial lead. Double glazed window to rear aspect. ( Wall mounted gas fire currently not working ). Back boiler that has working service history certification. Central heating radiator. Picture rail. Double glazed window to side aspect. The kitchen is fitted with a matching range of floor and wall mounted cupboard and drawer units, with work surfaces over. Single drainer stainless steel sink unit. Space for cooker, fridge/freezer and washing machine. Complimentary wall tiling. Central heating radiator. Telephone point. Wall mounted gas heater. Door leading to third reception room. Double glazed window to side aspect. Double glazed sliding doors which open out onto the patio garden. Doors to bedroom three and shower room. Double glazed window to side. Central heating radiator. Obscure double glazed window to side. Enclosed shower cubicle with thermostatically controlled shower. Low level WC. Pedestal wash hand basin. Complimentary ceramic wall tiling. Central heating radiator. Airing cupboard housing the water tank, with slatted shelving. Central heating radiator. High window for natural light. Loft access. Doors to bedrooms 1 and 2. Double glazed bay window and second window to front aspect. Built in wardrobes to both alcoves. Picture rails. High skirting boards. Central heating radiator. Double glazed window to rear aspect. Built in wardrobes to both alcoves and matching cupboard. Central heating radiator. The enclosed walled front garden has a pedestrian gate, with a pathway to the front door. The Southerly facing rear garden is laid to patio with low maintenance in mind, predominantly laid to paving, providing an ideal area for outdoor dining and sitting during finer weather. The garden is edged with flower bed borders, attractive mature plants and bushes. Brick built garden store. Pedestrian gate giving access to rear service lane. From our prominent town centre office, turn right, heading down Rolle Street and then take a further right at the roundabout, turning into The Parade. Proceed along into Exeter Road. Take a right turn into Danby Terrace where the property will be found on the right hand side, clearly identified by our For Sale sign.